Grangerland RFD - Where the girls are. These two girls had been left behind to complete the finishing touches on a lawn maintenance job. Red is the one on the left and she was named because of the red halter. It was the only way to tell the difference between her and Blue. 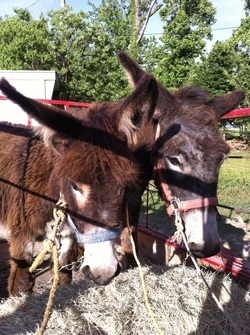 Even though the second donkey here has a blue halter she is not Blue. We think now that Blue was Red's mom and that’s why the two hung together so much. The blue halter here belongs to princess (Blue's daughter with a different day) who plainly announced her name to us less than a week after she was born. Princess may be two years old by now. We had a problem with a still intact Jack who became a Gelding just ten days before this picture was taken. The vet assured me that it was then safe to return these two young ladies to the farm. They are his Mom and Sister. I like this picture better because it shows them loaded. This picture also gives another good idea of how much bigger Red is than Princess. Red doesn’t care for this hairdo but it’s her that rubbed it off. In the year that she was gone she developed a split hoof and I have contacted the farrier. I guess I can't complain about loading a couple donkeys into a trailer. This guy must have gone through some real trials and tribulations to load a couple camels into a Toyota. This very low resolution picture shows the biggest problem I faced in returning the girls to the fold. These three youngsters (neighborhood boys) were loud and excited. Had to make them leave the pasture before I let the donkeys out of the trailer. The donkeys were just as excited. Excited kids plus excited donkeys makes one very apprehensive old guy. Once the guys were out of the pasture all I had was five excited donkeys and one excited llama. The next morning was even more exciting. They played follow the leader over a 5 acre tract of land. Four standard donkeys at a gallop one behind the other. They were followed closely by one miniature (the white one above) and one brown curly haired llama. Frankly, the llama could probably outrun most horses. He was bringing up the rear because he wanted to watch. All were at a gallop and the only thing that slowed them was a call to eat. King of the mountain on our mound of dirt was amusing and terrifying that day. Anyway they are all back together now. Unless I steel my resolve and sell somebody, that is how they will stay. I think I will give a breakdown of the individuals in this herd pretty soon. Just look for something probably called history of the herd. It will be in this same section of the website. Hope you enjoyed the read. Sometimes just watching donkeys play can tell you a lot about Humans. Coincidence, I think not.